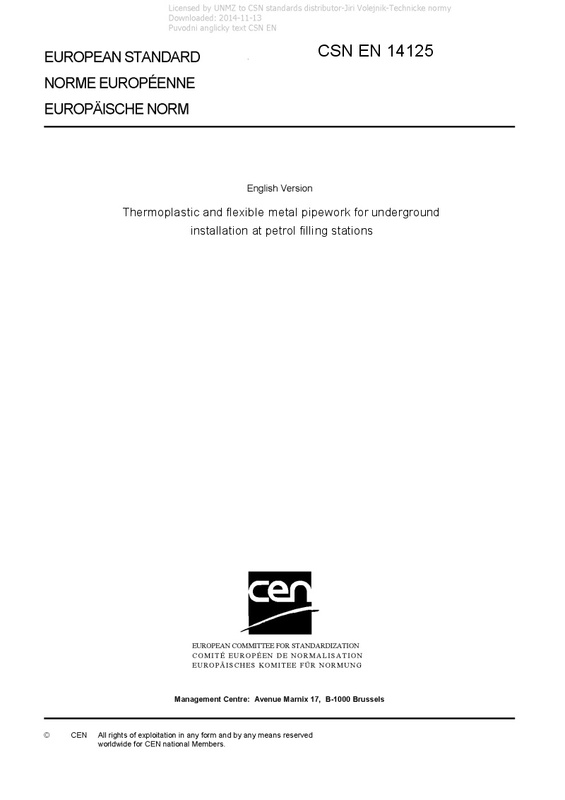 EN 14125 Thermoplastic and flexible metal pipework for underground installation at petrol filling stations - This European Standard specifies requirements for underground pipework systems used to transfer liquid fuels and their vapours at petrol filling stations. Minimum performance requirements covering fitness for purpose, safety and environmental protection are given. This European Standard applies to pipework made from thermoplastics, which may include some degree of reinforcement, and to flexible metal pipework. It does not apply to fibre reinforced thermosets, commonly referred to as glass fibre reinforced plastic (GRP), nor to rigid metals. This document applies to: - delivery pipes from tanks to dispensers, including positive pressure, vacuum suction and siphon modes; - fill pipes from road tankers to tanks; - vapour recovery and vent pipework; - pipework for secondary containment; - fittings. It does not apply to pipework for use with liquefied petroleum gas.